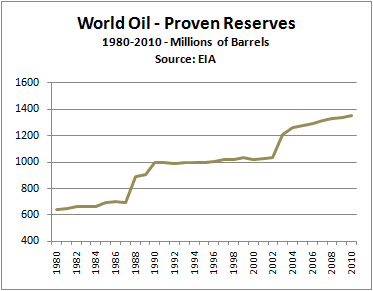 Expanding Reserves of OilAlthough world oil reserves continue to grow, it is crucial to explore a wide range of new sources for energy and fuels. The use of syngas from the gasification of coal and / or biomass will take advantage of new technologies, to provide electric power, process heat, and syngas for chemical synthesis and fermentation -- for hundreds of years into the future. A "polygen" plant in Texas will use coal gasification to produce electric power, steam, CO2 for enhanced oil recovery (EOR), and multiple chemicals -- including sulfur, urea, and argon -- for sale in global markets. It will be an IGCC plant with carbon capture. Saskatchewan is waking up to coal gasification as a clean alternative to nuclear power. British Columbia's Nexterra Systems Corp. is installing a biomass gasification system at the University of Northern British Columbia in Prince George. The plentiful woody biomass resource will provide abundant feedstock for the gasification facility, primarily meant to provide heating to the school, but can also provide reliable electric power. A unique biomass gasification plant in Florida will provide electric power, process heat, and syngas feedstock for the fermentation of ethanol fuels -- and perhaps eventually other, higher value fuels and chemicals. Gasification facilities are ideal for providing clean combined heat and power (CHP). The advantage of biomass gasification plants is that if the biomass feedstock is locally produced, it is unlikely to suffer interruptions due to transportation breakdown, for whatever reason. Peak oil is a sad excuse for a belief system, but even a doomer should be able to open his mind to a wide range of other sources for fuels and energy. Always prepare for possible disasters and extended emergencies. But don't base your hopes or plans on them.